Once you’ve decided on the type, size and shape of your pool, the fun really begins. It’s the extra features and designer touches that make your pool uniquely yours. Whether your vision is elegance or an over-the-top tropical paradise, Unique Landscapes can help you choose the right combination and bring it to life. Get creative with your pool with custom baja entries, tanning ledges, swim-up bars, lazy rivers and negative edge pools to add more fun and function to your pool. We can create you a custom pool, traditional pool, free-form pool, natuaral pool or an architectural pool. The options are endless. What to use for the interior finish of your pools is one of the most important decisions. Not only will different types of interior pool finishes affect a pool’s looks, the finish can also ensure that your pool remains in good condition for years. The most common, and the least expensive option out of the different types of interior pool finishes, is plaster. Plaster is available in white and other different colors as well. White plaster has been around as long as people have been building swimming pools and it remains a popular choice in spite of the many different choices that have come into the market in recent years. Pebble pool finishes contain a blend of hand selected natural pebbles and other aggregates that combine to create the strongest and most durable bond in any pool finish. The pebble pool finish allows for variation in textures and offers near limitless customization options. Pebble finishes are known for being the strongest and most enduring finishes in the industry. The pebble finish complements natural surroundings and is known for it’s ability to create a lagoon like environment, making it a great selection for those looking to create a custom back yard oasis. Though most experts agree that tile is the best pool finish in the long run, it has its drawbacks. Compared to other methods, tile is initially very expensive to install. Finishing a swimming pool’s interior with glass tiles creates a mesmerizing effect, as the tiles reflect light and make the water come alive. Glass tile adds immense beauty to swimming pools, and when installed properly, most types of glass tile represent the most durable of all swimming pool and spa surfaces. Glass tiles come in a wide variety of shapes, colors, and finishes, and can be used to accent any style of pool, be it traditional, modern, or natural. Set the stage for a dynamic poolscape with a custom decking and coping design only you can dream up. The installation of waterline tile generally happens before or after the “decking” phase – depending on the type of deck. Our professional tile setters have years of experience and can set tile along the waterline of your new swimming pool: decorative mosaic tile, coping, and more. Water features can be natural rock, artificial rock, block or stone. Unique’s pool construction process integrates our water features at different points throughout the project – depending on the type of feature. A properly designed & well-built water feature is key to any new swimming pool & spa project. Swimming pool lights create various displays, colors, and designs depending on the system you select, from warmer toned yellows, oranges, or reds to relaxing greens or blues. Aside from enhancing the beauty of your backyard and swimming pool, there are also sensible reasons to invest in pool lights; pool lights provide visibility underwater, near steps, and on sun shelves and seating areas. 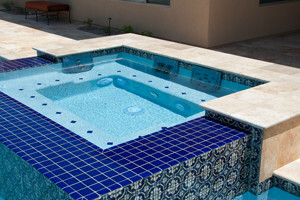 A custom spa or Jacuzzi is a great addition to any swimming pool. Custom spas add value and relaxation time to your pool. Most of our custom spas are attached to the pool, and create a great waterfall or spillover for our swimming pools. Unique’s spas are custom designed and built with therapy as the main goal. Add a splash of fun for kids of all ages with slides, diving boards and other recreational add-on’s such as a splash pad area. Make pool maintenance easier than it has ever been with automated cleaners and pool controls.